I’m hoping that you are able to come to OffBeat’s 23rd annual Best of the Beat Awards on January 25 at Generations Hall. It’s the time when we celebrate our local musicians and give them the accolades they deserve. In fact, I wish we could do it more often, but then it wouldn’t be special, would it? By the way, by the time this issue of OffBeat hits the street, you’ll still have time to vote for the bands and recordings that should be honored this year (voting officially ends on Friday, January 12), and you’ll be able to purchase tickets for the party event. Both voting and ticket sales can be found at OffBeat.com. We’re also honoring Best of the Beat Lifetime Achievement Award recipients at a smaller event on January 18 at the Orpheum Theater, where we’ll give Big Chief Monk Boudreaux, Steve and Cézanne Nails, and Michael Pellera awards for their contributions to our vibrant music scene, and the Positive Vibrations Foundation will honor Anders Osborne and Clarence Johnson III for their contributions as well. The Best of the Beat Awards (and OffBeat, for that matter) were created because music and musicians were taken for granted in their own home town. 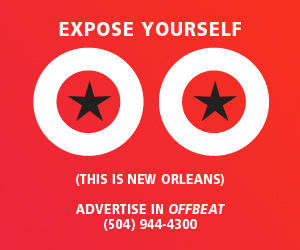 This is pretty common in other cities with a decent music scene, but I thought it was egregious that locals and businesses didn’t understand or honor music as the foundation of New Orleans’ unique culture. That’s what we are all about. The Best of the Beat is a project of the non-profit OffBeat Music & Cultural Arts Foundation, which was organized to keep the Best of the Beat Awards alive and to continue to support local music. OffBeat presents the awards, and we we couldn’t do it without our partners who include the Positive Vibrations Foundation, Generations Hall, the Orpheum Theater, WWL-TV, the New Orleans Advocate, Ace Hotel, WWNO, WYES, WWOZ and WHIV-FM and the many restaurants and volunteers who help us celebrate local music. I truly want all musicians to be involved in this event; we want to showcase all music and musicians, and give them the opportunity to shine in the public eye. In a world that’s dominated by social media, I find that many up-and-coming musicians and bands don’t get as involved as they should in promoting themselves. OffBeat—and the Best of the Beat Awards—want to help sustain our music scene. We’re not just about “classic” New Orleans musicians: We’re supporting young bands, singer-songwriters, hip-hop—the whole spectrum of New Orleans and Louisiana music. So if you feel slighted, for any reason, try to stop by and let us know about you and your music. You’re always welcome.